Double rewards for a wayside ramble that&apos;s only accessible in the summer season before snow closes the road. Proxy Falls Trail #3532 is located just east of McKenzie River off Hwy 242 in the Cascade Mountains. One stream cascades into two separate shimmering veils dropping 226 feet (68.885 m). Instead of feeding a stream, the water pooled at the foot of the falls seems to disappear, but it&apos;s actually sinking through the porous lava into the ground. Touted as a family-friendly hike (but not ADA accessible), the dirt and lava-rock trail is an easy loop totaling 1.5 miles (2.4140 km). 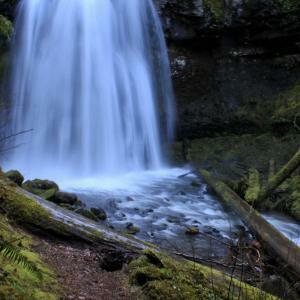 The trail showcases two distinctly different waterfall views of the upper and lower sections of Proxy Falls. At the bottom it is possible to scramble close to the water and feel its spray. As with all waterfalls, watch for falling rocks and debris. 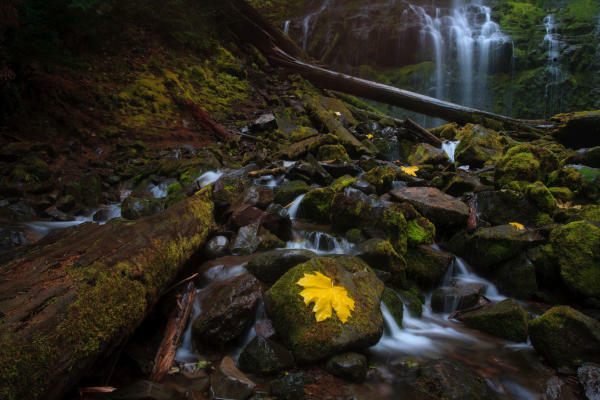 Proxy Falls is among Oregon&apos;s most frequently photographed waterfalls. So don&apos;t forget your camera! Directions: From the junction of Hwy 126 and Hwy 242 (just west of Belknap Hot Springs), follow Hwy 242 for 6.5 miles (10.461 km) to roadside signs marking the Proxy Falls Trailhead. CLOSED FOR 2018 SEASON A true sense of deep-forest solitude and mountain beauty is found at Proxy Falls. Hike the 1.5 mile (2,4-km) loop trail through open lava fields and dense forest to view two distinctly different waterfalls. Proxy Creek is part of the McKenzie River watershed in the Three Sisters Wilderness section of the Willamette National Forest. The road accessing Proxy Falls is typically closed to motor vehicles mid-November to mid-June. Pay station on-site or Federal recreation pass honored. DAY-USE FEE AREA/RECREATION PASS REQUIRED. Camp at Alder Springs or Scott Lake. Explore the area&apos;s GeoTrails. Enjoy the scenic drive along Hwy 242 through barren lava fields to the castle-like Dee Wright Observatory. Proxy Falls is close to Mt. Washington Wilderness and the Pacific Crest Trail. Unwind at Belknap Hot Springs with its mineral fed swimming pools, family friendly riverfront grounds and beautiful lodging and campsites. 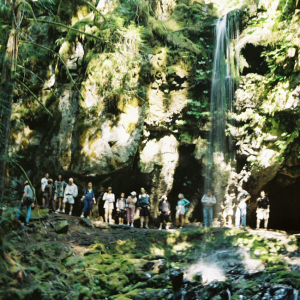 Hike or bike the famous McKenzie River National Recreation Trail.